Plasma physicists from Chalmers University in Gothenburg, Sweden, have devised a new method for decelerating stray electrons inside nuclear fusion reactors; a problem that can destroy the interior of a reactor without warning. Using plasma simulation and mathematical descriptions, they were able to predict the energy of the electrons and how it changes under different conditions. Fusion reactors, currently under development, use electric fields (among other methods) to accelerate charged particles in a plasma made from hydrogen to the high speeds necessary to force atomic nuclei, stripped of their electrons, to overcome electrostatic repulsion and fused together, releasing energy. 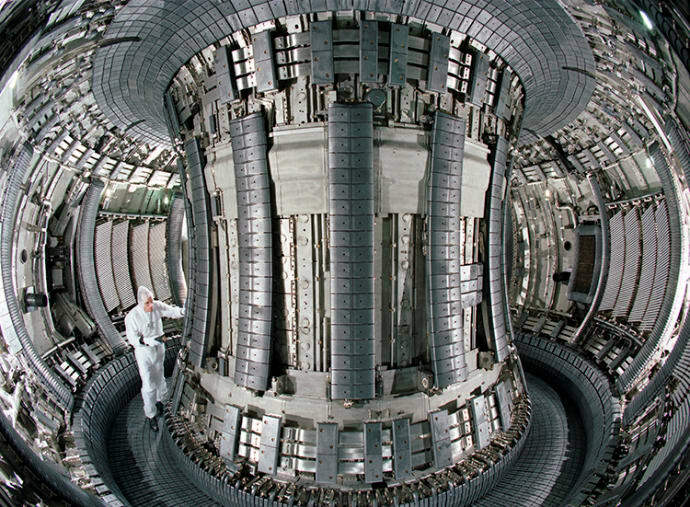 One of the problems that has been encountered in operating fusion reactors is that unwanted electric fields can develop suddenly in the plasma, and accelerate stray electrons to very high speeds, flinging them into the reactor walls and causing damage that would require the reactor to be shut down. Doctoral students Linnea Hesslow and Ola Embréus have now determined that possible to slow down these electrons to harmless velocities by injecting heavy ions, made from gases such as neon or argon, into the plasma in the form of gas or pellets. In article in the journal Physical Review Letters, they describe how the electrons collide with the high charge in the nuclei of the ions, causing them to slow down to a speed such that the fusion reaction can continue. “When we can effectively decelerate runaway electrons, we are one step closer to a functional fusion reactor. Considering there are so few options for solving the world’s growing energy needs in a sustainable way, fusion energy is incredibly exciting since it takes its fuel from ordinary seawater,” said Hesslow, who along with Embréus has been presenting her results at plasma physics and fusion conferences around the world. “The interest in this work is enormous. The knowledge is needed for future, large-scale experiments and provides hope when it comes to solving difficult problems. We expect the work to make a big impact going forward,” said Prof Tünde Fülöp, the researchers’ doctoral advisor and co-author on the paper.